Another view of Crabby Pirate. Cottage charm with window boxes, native plants and shutters. Just how a cottage is supposed to look on Tybee Island! Arrrggghhh Maties! Welcome to the Crabby Pirate! Bedroom #1 with Queen bed. Bedroom #3 with full bed. The cottage is completely fenced in including the front gate arbor. Makes for a safe place for kids and pets to play! 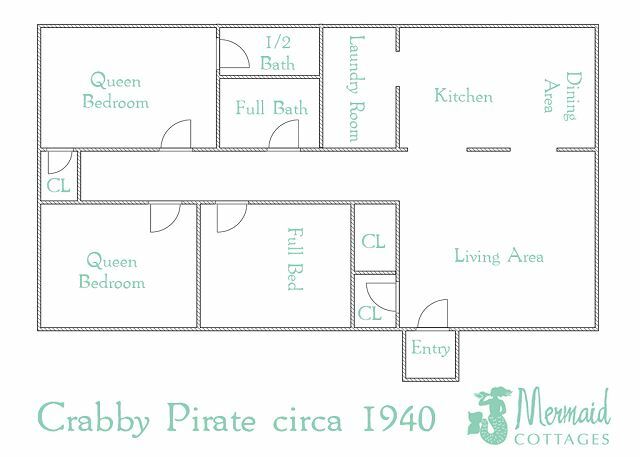 Mermaid Cottages welcomes you to Crabby Pirate! Another view of Crabby Pirate cottage. Front door of Crabby Pirate cottage! Outdoor seating overlooks the marsh. Living room with family friendly seating. Enjoy your free complimentary sample of Mermaid Morning Bliss (MMM Bliss!) coffee while here and remember it is available for purchase in full-size bag at Seaside Sisters on Tybee. Proceeds go to sea turtle preservation on Tybee and throughout the world! 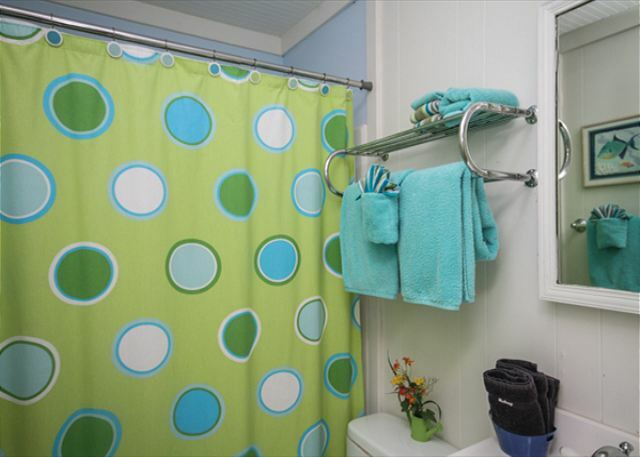 p>This value-priced home sits directly on the Marsh and is on family friendly Lewis Ave. This house is right next door to Horsepen Creek Cottage and Dock, so if you're planning a larger family gathering you can have two homes next door to each other! 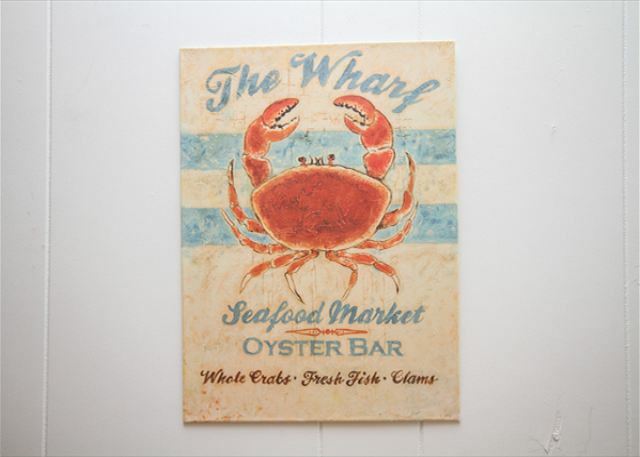 It's also just down the street from Madelyn's on the Marsh! Pet-friendly with fenced-in yard. Complimentary WiFi. Bright and cheerful cottage colors. If this house could talk it would tell you some stories! Large grassy area for playing and relaxing with seating and charcoal grill. Outdoor patio seating to bird watch on the marsh. 15 minute walk to the beach. Lewis Avenue is home to Tybee's largest family Halloween celebration and a must see in the fall! Had a great time everything was as stated. Guest services was friendly, courteous and helpful. We have stayed the month of February for the past 11 years and the property is always top notch and any issues which are very few are taken care of very promptly. The Crabby Pirate is very comfortable and we love the location and our dog loves it too. The Mermaids are great and always take excellent care of our needs. We would definitely recommend renting through Mermaid Cottages. We have always enjoyed our vacation stay with Mermaid Cottages. When we had to leave quickly due to Hurricane Michael, the Mermaids mailed us several items we had left behind. Their service is second to none! Thank you Mermaids! was good for us. Rooms were clean. Plenty of towels etc. Great, peaceful get away! Quiet and very accommodating. Close to everything!! Mermaid cottages was very professional and accommodating. I have one comment that I feel should be mentioned in the description of this cottage. Able to jump the fence. It was very nerve racking. Also the sand spurs. I still am giving 5 stars but felt you should know. an easy bike ride to the beach & the whole island! the back fence is not complete so not safe for a dog that likes to escape. We had a great stay at Tybee Island and st out rental place the Crabby Pirate cottage . It was very clean and very accommodating . With plenty of towels and space for our family . Our dog Jack loved the fenced in accommodations as well . The starters kit or supplies got us through the week and we where very happy to have stayed once again at a Mermaid Cottage . The only thing we didn’t do to well with was the bed , we have a king size at home and the one ate the cottage was smaller . The Madelyn in the marsh bed was much bigger and we found it more comfortable . Other than that the furnishings at decorations were very quaint and relaxing . We will be back to Tybee I’m sure. Thank you ! Beach Theme Rooms are nice! I liked that name "crabby pirate!" 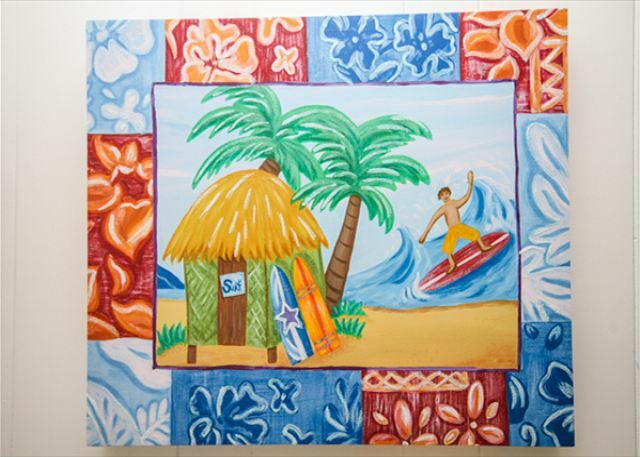 We step in the cottage & feel welcome with all that beach theme in every rooms! Good parkubg space for 3 cars! We also went backyard to see sunset & saw a few crane birds! The only things we're not happy with is 2 TVs kinda small. We couldn't read close-caption for deaf on TV. The master TV not working well & it's small, too. Other than that, it's nice rooms & all the decors. Took us 5 mins drive to beach. We eat out at Fin Rock at the corner of Butler Ave before head back home. We had a wonderful stay at the Crabby Pirate, the weather was HOT , but we had a cool house waiting for us when we returned from our adventures !! Everything you could ask for in a home away from home , including a lovely fenced in yard for an evening cookout and charcoal for the grill !! The kids can't wait to come back !! Great vacation with our pups!! The Crabby Pirate was a great place for our weekend vacation. My pups loved the yard, it was very well manicured. The home was clean and had everything we needed to be comfortable and eat a meal at home. The Mermaid coffee was delicious. My only suggestion is that some outdoor lights would be great for taking the babies out after dark. Having Stayed at several Mermaid cottages in the past, this one was not up to par with the others. The place is not dirty, but the paint is old, the TV stand drawer is broken. For $700+, we could have done better. Ads show dock...but there is no dock. Yard is barren, lacking grass..with pets it's a nightmare with the sand. We had a great stay - the home was very clean, the kitchen had everything that we needed and we were walking distance to the beach. We had a great time! Thank you so much for staying with us!!! did you know that a portion of your pet fee goes to support our animal rescue work here in savannah/ tybee and around the country! please thank your dogs for staying with us! The mermaids of tybee island. A Great Place for a Great Vacation! We spent 5 nights at this property for our latest foray to the area, and it was ideal! The cottage was clean, airy and comfortable. All the utilities and appliances were in good order, and location is conveniently located, yet is quiet and relaxing. The Mermaids (as always) do such a super job of preparation, I still do not know how well they respond to problems-so, I would give them 6 stars on the service aspect! Mermaids, thanks again- we will be back! A very comfortable cottage, clean, well equipped and in a quiet neighborhood. Lots of playful art work, good sun light and space to relax in. You have to drive to the beach, restaurants or to shop, but a good neighborhood to walk a dog. I wouldn't hesitate to recommend this cottage to family or friends. Also I want to thank management for not only their professionalism, but their kindness. Rental experience was great. Excellent organization by the host(s) and good communication throughout the time of our stay. It was "all good". No negative surprises and we had everything we needed. Our 10th February and it is always Great! The Mermaids are absolutely the best. The Crabby Pirate truly is a home away from home. There is great biking on the island and we enjoy riding and exploring Tybee. getting away from snow and cold for a month is perfect. The Crabby Pirate is always clean and a very comfortable place to relax. This was our 2nd time staying at the Crabby Pirate and our fourth time at a Mermaid cottage. Every time is just as wonderful as the last. The attention to detail and outstanding service is unbeatable. It was a couple years since our last stay at the Crabby Pirate and I noticed the house had been painted and a few more decor touches were added. The house is well stocked with the essentials and very clean. It is great to make a few meals at home and prep beach lunches. I did a couple load of laundry and the washer and dryer work great and also very clean. Be sure to relax in the back while watching the sunset over the marsh. We brought our bikes with on this trip and biked around with ease. A nice surprise from Jennifer, a Mermaid staff, contacted us to offer an extra free night on Sunday and check out instead on Monday. It was a slower time of the year and new guests were not arriving until a couple days later. Luckily we were able to accept and took advantage the extra stay. Our 3 night was now a 4-night stay and it was a blessing to have another relaxing day. Thank you and we can't wait until our next Tybee visit. The house met our needs in every way from supplies to linens to comfortable beds. The walk to the beach isn't bad at all especially if you take a portable wagon to help carry supplies. We are a family of seven and we would take a load of folks and supplies to the third street beach entrance so the beach set up process could begin and then return the car to the house to walk with the rest of the gang. Sometimes we just walked the full way for the exercise. The house is older but for the price, cleanliness, access to everything, and the comfortable beds, the entire package was worth it. It was good to get the exercise after eating all of the local foods! We are so happy you were pleased with your stay at Crabby Pirate. We appreciate our guest feedback and letting us know how we can do better in making our cottages the best they can be for our guest. Thanks so much, Denise and the Mermaids. Absolutely loved the location. It was quite and very relaxing. The yard was large and inviting. Could not of picked a better place to stay. Very close to the ocean. We had a blast we were there for our wedding. Meet Beverly one of the cleaning ladies and she was so nice. The house was clean and comfortable. Perfect for dogs as the floors are all tile. It was an unusually hot week for May, and the AC worked perfectly. Beautiful view of the creek and salt marsh. The one thing that would make this a perfect rental would be a screened porch with a view of the marsh, perhaps at the side door. A major expense I know. But over all, very nice, and very quiet. Upon Arrival we immediately smelled the fantastic Confederate Jasmine blooming. The little cottage was well stocked and clean, a little residual sand on the floor but it is on the island so you come to expect that in my opinion. I was very impressed buy the fact that we never ran out of hot water! The view off of the marsh was beautiful and if a dock could be added one day that would be awesome even with the bugs! I am so glad I was finally able to stay in a Mermaid Cottage and I cant wait to come back and stay in another one there are so many to choose from its hard to pick a favorite! We all enjoyed our stay. Great place for kids. Amazing little cottage, perfect for a girls getaway. Everything you need is there. Not fancy or upscale but comfortable and perfect for our needs. Beds were amazingly soft, with lots of pillows,and plenty of towels. Kitchen is functional and equipped with everything you need to create a fantastic meal a home. We loved the quiet, but easily accessible location. I can't say enough good things, we didn't want to leave! This was a great base for a vacation with our adult children! Quiet spot on the marsh and a short (15-20 min) walk to the beach. Would love to come again. A very positive and relaxing experience. The Crabby Pirate was spotless and in great condition. 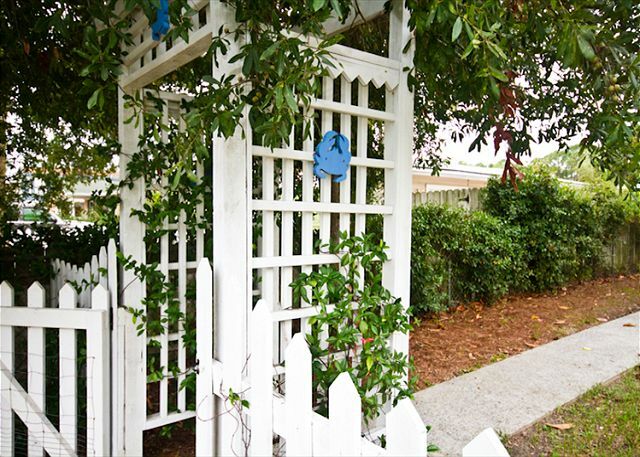 The location is perfect for us as it is a quiet street and the fenced yard is great for our dog. It is roomy and the bath and 1/2 is nice when our family members visit. A very comfortable and cozy cottage. The Mermaids do a wonderful job and took care of one minor problem (dead battery in smoke alarm)immediately. We would most certainly recommend this cottage to a friend or relative. My two sisters and I loved the vintage charm of the cottage and the lovely view of the marsh. There was a lot of construction going on as neighbors up and down Lewis Avenue recover from the recent storm. All construction crews were very respectful and conscious of not hammering too early or too late. Two small suggestions for making future guests happy and comfortable: 1. There are some gaping holes in the fencing in the backyard that made it impossible to let our little dog run around freely. And 2: There were a couple of rainy days during our weeklong stay, and it would have been great to have a slightly bigger TV (with a functioning stand) and at least basic movie channels. Both are relatively inexpensive fixes that would have a big impact. Overall, the cottage didn't seem quite as immaculate and well-maintained as other Mermaid properties I've seen. But we still had a great week! Clean, adequate. No disposal or dishwasher. The cottage was perfect for three little ones with my daughter and helper. it was great, because with my daughter being Kosher Diane the owner provided a new microwave and my daughter was able to handle meals etc. They were there to greet us and help us with luggage etc as well as answer questions... Really wonderful people. Will definitely return. My family and I love coming to Tybee Island whenever we can. We stayed at the Crabby Pirate and found the cottage to be in a central location to everything we wanted to do on the island. The cottage was spacious enough for the 4 of us and was clean and inviting. You can never go wrong staying at a Mermaid Cottage! The cottage was just as advertised! Lovely property, quiet and inviting. Close enough to the beach and shops for our purposes! We love Tybee Island, so we were excited to head back there for a four-night stay for Memorial Day weekend. We brought our two dogs, and every thing about Crabby Pirate was perfect -- size, location, and cleanliness. Even though it rained for most of Sunday from the edges of a tropical storm, we were able to enjoy our stay. The beach was only a 15 minute walk, and we also walked to Bowie's seafood for local shrimp to grill. The dogs loved the fenced in yard, and we thoroughly enjoyed sitting and enjoying the salt marshes behind the house. We would definitely stay here again. We loved this sweet little cottage; there was everything we could possibly ask for! Plenty of room, the care package was plenty for the entire week, and the view of the salt marsh was beautiful. Everyone along the street was friendly. We will definitely visit again! Family of 5 plus weiner doggie - Loved everything about this cottage. Cute, clean, comfortable. Rained one afternoon, so we used the Pictionary game in the closet. What a blast! Great people to work with, came immediately for a minor problem with bath faucet. The 10 min walk to the beach is fine unless you are carrying stuff - then it is 10 min too long. Cannot wait to return one day and maybe try some of your other cottages. Great Job and thanks for a marvelous vacation. Jennifer M from Covington, GA does not recommend this vacation rental. I enjoyed our stay at ****** Pirate. The only bad thing I can say is the bed in the master bedroom was the hardest bed in the house so me and my husband ended up having our daughter sleep in there. Otherwise it was clean,quiet and peaceful Will stay again. The place is so welcoming and comfortable. Had a blast! Beautiful cottage. Felt like a home away from home. If you like "comfy and cozy" then this locations would definitely fit your needs as I love comfy and cozy. I brought my dog; my parents brought their dog and they definitely enjoyed the freedom of the spacious backyard which was nice. The A/C unit is a little loud but not too bad and the guest bathroom could have used a little more cleaning which was an easy fix. Other than that, we all really enjoyed ourselves and my parents especially since it was their 30th Anniversary! The property management team was extremely friendly and quite generous to us and we were so thankful. I'd recommend this location to a small group of friends or even a small couples retreat! I'll be back here again soon! We love the Crabby Pirate. We have been staying in The Crabby Pirate since 2009 for the month of February and it has always been clean, well maintained and well equipped, we could not be more pleased. Delightful cottage, great place to stay while kayaking!!! Great place to stay. The house was cute and had everything we needed. I especially liked the decorative lights that came on at night. The sunset was really beautiful from the backyard looking over the marshes. My family had a good time over the 4th at Crabby Pirate. My fiancé Jim was bitten by a wasp while trying to get the key out of the lockbox. We called Mermaids and they promptly had a guy come out and spray the wasps. We also had water dripping onto our food on the top shelf of the refrigerator the first morning. Again called and Linda made several phone calls over the weekend trying to make sure everything was alright. Washed a lot of dishes over the weekend. Really missed my dishwasher and garbage disposal. Overall, the cottage was a comfortable, pleasant home for my family. thank you so much, wasps have been a real problem this year and we're trying very hard to find products that rid the homes of wasps, but still don't affect the environment with toxins. Wish we could of stayed longer!!!!!! The Crabby Pirate was off the beaten path with a lovely view of the marsh. Great to have a pet friendly place for our little dog! Nice cottage with marsh view! The 5 of us and our wag pack enjoyed our week long stay at the Crabby Pirate. Pretty marsh view, fenced yard, two outdoor sitting areas and ample parking on a quiet street in a good location. Cute beach cottage decor inside with most of the comforts of home. We had a fantastic time in Tybee Island and love Mermaid Cottages!! The Crabby Pirate was the perfect house for us. I was able to bring my 2 small dogs and enjoy my vacation with them. The house was charming and quaint. The view from the backyard over the marsh was gorgeous and we enjoyed sipping coffee every morning listening to all the birds. We will definitely be staying in a Mermaid Cottage again in the future!! We had to be on Tybee for a few work events and this was a perfect "cozy" place for us to stay. The three of us are coworkers & friends, so not a problem to be in close quarters. The marsh view is lovely and the water pressure is great! As always, the Mermaid Crew is spot on - called before arrival and check in on occasion. Thank you for a great experience!! Four generations of family trying to visit old stomping grounds over Spring break. We all love funky so this cottage was no problem for us. For a neat, clean basic, economical three-bedroom this was OK for a short stay. I recommend South Beach for beauty & solitude. Lazaretto Creek Marina has great restaurants & bars/kayak rentals. As always, the Mermaids made our stay perfect! We stayed at the Crabby pirate for a long weekend in March for a wedding. Everything was exactly how it looks in the photos. Had a great time and would definetely come back. Thanks! We love the Crabby Pirate, it's clean, comfortable, and in a great neighborhood. A really good view of the marsh and very friendly people on Lewis Ave. Mermaid's services are great. house and it's decor but still it had all our home comforts. My only small suggestion would be the addition of a dishwasher-but then I really hate washing up! Apart from that, I thought Crabby was almost perfect. We as grandparents were able to enjoy some time with our kids & grandkids. The home was clean, cute and met our needs. Thank You for a awesome vacation. We have a wonderful stay at Tybee, The beach cottage was just what I expected it to be. I would go back and stay at this cottage again. Keep up the good work Mermaid Cottages. My family and I enjoy this cottage so much we have stayed here for the last three years. We have enough room for three teenagers to enjoy. The place is always clean and well stocked for our stay. We enjoyed the fact that we were within walking distance of the beach and lots of the shops. We would love to try another of the cottages next year or maybe we will be back in this one again! Thanks so much for your review & recommendation for Crabby Pirate! We love hearing from our repeat guests and we invite you back; come see us again next year for sure; at Crabby Pirate or any of our other great cottages! Granddaughter's 18th birthday. Friends and family could come and go with adequate parking in front of the cottage. Enough privacy for me to supervise but not be in the way. Perfect! We had such a great experience at the crabby pirate. The fenced in yard was perfect for my 1.5 year old twins and 3 yr old daughter. A member of the mermaid team even stopped by to check on us and see if we needed anything. That's was so sweet. And thanks for recommending tims for cribs... so great for the little ones to have cribs away from home. Thanks so much for everything. Plan on coming back next year and getting bigger placed for some extened family to come too!!!! This was our first experience staying in a marsh view cottage. I liked that the traffic was less and it was more quiet on this side of the island, and the sunset view is also a plus. The only downside is that I wished the outside sitting/chilling area was a little more inviting. There was a table, chairs and umbrella, but compared to other Mermaid Cottages this one needs a little more "cutification" and coziness. The cottage inside was great and had all the necessities. This trip was clouded by the very recent loss of our 16 year old chocolate lab, Timber. She was going to join us on this trip, but unfortunately she could not. When I walked into the cottage it was lovely to see the picture of a chocolate lab like dog looking out onto the ocean. It felt like she was there with us in spirit. We love how Mermaid cottages does a lovely job of offering cottages that are pet friendly. Timber loved the special treats. This time we rented bikes and will be making it a habit. 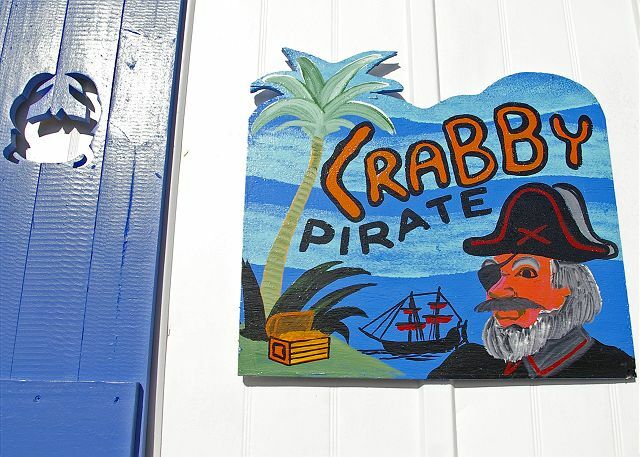 The location of the Crabby Pirate is convenient and it was very easy to ride to the shops, beach, and restaurants. If you like to find unique items, be sure to checkout the artist market. We had a great sunset dinner at Coco's, explored a few historical sites in Savannah, took a sunset dolphin tour, and relaxed on the beach. We try to take an early Summer vacation in Tybee Island every year, and our choice of stay is always Mermaid Cottages! Love their quality and high sense of customer service. This stay was no exception! Quiet street, great afternoons on the backyard enjoying the marsh, house in perfect order. Perfect! Convenient to the beach, convenient to the wedding chapel, and just the right size for our family. The cottage was spotless and in good repair. Good price, and the property management was friendly and professional. We couldn't be more pleased! This was our second stay at the Pirate. We love the location on the salt marsh. The house has a great "homey" feel. It was a great place for a two year old. We would be glad to stay a third time. My 28 year old daughter, grandkids ages 5,4,3 and myself rented the Crabby Pirate cabin for almost one full week. We were delighted! The cabin was extremely roomy with 3 bedrooms and 2 baths. Everything we needed was there, including coffee! Our 1st day there we had a bar-b-que in the yard after spending hours at the beach (only minutes down the road). The location was perfect, we were close to the beach but also close to the exit off the Island as well. We spent a lot of time in Savannah and it was just a short drive away. I would definitely come back to this cabin, or any of the Mermaid Cabins again. We enjoyed our stay at the Crabby Pirate. Mermaid Cottages was very helpful. When we discovered that our coffee pot was on broken, the office brought one over right away so that we could enjoy our morning cup of joe. We could not have been happier with the property and management! Will return! This was nice and cozy little cottage. The only thing that I found that could use some improvement is the bed in the master. It was a little too firm. Other than that it was wonderful! Very authentic Tybee Beach experience. We came in to lots of rain! But luckily the sun came out 30 minutes later! We loved our stay at the Mermaid Cottages Crabby Pirate! Biked to the beach everyday and enjoyed some great food too! Our second time staying in a Mermaid Cottage. Already picked out one for next summer! Thanks so much! We love Tybee! Roger B from Athens, GA does not recommend this vacation rental. Hoist the Happy Flag at Crabby Pirate! The floor wasn't clean. The mermaids showed up immediately and took care of it beautifully. The high grass and proliferation of ants in the yard made it unusable for pets. However,I do understand and care about Pesticide runoff the marsh. Loved Crabby Pirate; so cute; the mermaids, so good at what they do, Tybee. Thank you so much. You are the best! Mermaid Cottages are the best! This is our 3rd Mermaid Cottage experience. We love Tybee and the cottages are the perfect place to stay. We have everything we need and everthing is always spotless. We are already planning our next visit for the fall. Great customer service and very good cottage for two families with young kids - they could run around like maniacs and have a blast! The place had absolutely everything we needed. This cottage was great! It was clean and well stocked with our needs. I was impressed with the room we had, we had three teenagers with us and there was ample room for everybody to relax and enjoy. Would love to try other cottages but this one was so nice we will most likely use it again. Grabby Pirate cottage created a fun time that easily afforded a walk to the beach to see the sunrise. The residents on Lewis Avenue very friendly would talk and wave. Excellent place for our dog to stay. The cottage was very clean and comfortable, and had everything we needed. THe rental company is available 24/7 if you need anything. I would highly recommend this cottage and rental company to anyone! Awesome stay!! This property is a bit more rustic than the other Mermaid Cottages where we've stayed, but it's described as a "budget stay," so we came prepared. It's cute - and we enjoyed being on the marsh for a change. Everything was perfect. I forgot the key code but was able to call when I got there. We had a great experience-we are from Tybee and knew the location. Next time I would rent the next door cottage with dock. Mermaid Cottages is running a great Tybee business. Great coffee too! Thank you. Myself and 5 friends had a wonderful stay at The Crabby Pirate! We had a perfect Labor Day Weekend in the cottage with absolutely no problems with the house at all- even had perfect weather to go along with it! The communication with the Mermaids prior to our arrival was great- very prompt, friendly and professional. We had no reason to contact them during our stay. The marsh was a great backdrop and the two outdoor tables and the fenced backyard was perfect for evening bonding with friends and play time for my lab, Shiloh. Thank you for a wonderful place to call ours for our weekend on Tybee! Had a great time with the family at this family friendly cottage on the marsh. Mermaid Cottages customer service was excellent, this was our second stay with them and they did not disappoint will be back! The last day the AC quit at the Crabby Pirate quickly became unbearable pushing 90 degrees inside. Mermaid came to our rescue & quickly relocated us to a nearby cottage, the Shrimp. We spent our last night in comfort ( including a patio hammock) & were given ample time to check out of both locations the next morning. A slight inconvenience, but considering the extreme July heat & the unexpected circumstance, we were very pleased with the outcome. Would definitely recommend to anyone looking to relax on Tybee. Both properties had everything we needed & more. We plan to return asap! Thank you MC! IT WAS NICE AND CLEAN AND EASY. I LIKE HOW IT WAS MADE AFFORDABLE BY BREAKING THE PAYMENTS UP INTO 2 DEDUCTIONS. NEEDLESS TO SAY--WE WILL BE BACK!!! Good location on Tybee. Easy to get to Savannah. Enjoyed our return visit. The Cottage - Based on our experience and rental needs, this cottage was the perfect place for us and we highly recommend it. The cottage was very clean, well laid out floor plan, large fenced yard, plenty of parking, very pet friendly and very family and I were very comfortable there. Mermaid Cottages - This was our first time visiting Tybee Island so I decided to contact as many property owners/managers as possible and decided to work with the ones that wanted our business. I sent out some 14 e-mails requesting rental info/pricing based on our specific rental needs. Overall, I received 8 e-mail responses, 2 phone calls and 4 no-responses. Of the 8 e-mail responses I received, they either had nothing available based on our rental needs/price or they were up-selling me. Of the 2 phone calls I received, one did not meet our needs/price and the other was Jan with Mermaid Cottages (on a Sunday afternoon, within 2min after she received my e-mail). Simply put, working with Jan and the rest of the team at Mermaid Cottages was the best vacation rental experience that I have ever experienced! Starting with Jan....she listened to my rental needs and heard the details....The team at Mermaid Cottages is very organized, they provided prompt & detailed information, that was very important as we had never been to Tybee. My next stay(s) on Tybee Island will be with Jan and Mermaid Cottages.....I wish I could use Mermaid Cottages for all my vacation rental bookings at other locations. We stayed here for St. Patty's Day and it was perfect. Short stroll to the beach and close to everything we needed. Every amenity was provided even coffee! We will be back! Clean, cute cottage and AFFORDABLE Retreat!!! I used to run my own vacation cottage in Asheville, NC. We were the # 1 booked cottage with our agency; I worked very hard to keep it that way. I mention this because I read some of the reviews and could not help thinking that things like sand burs are simply not preventable (It's the beach) and hand washing dishes was no problem for us. The price for this house is lower than most which is a huge advantage if you live on a budget, but I assure you that this house and the vacation it allowed us was very special. The cottage has THREE (!) very comfortable bedrooms. We arrived with my in-laws, their small dog, my 6-year-old, my husband and myself. We had no problem sharing the full bath (there is a 1/2 bath in the master) and the kitchen was wonderful. The house was immaculate- the kitchen, the bathrooms, every room was spotless. I LOVED waking up in the morning to have coffee overlooking the marsh and the sunsets are of equal beauty. This is a neighborhood composed of mostly full-time residents and it is extremely quiet. My family loves to ride bikes and we were able to roll out through the garden gate several times a day, hang a right and bicycle to the main beach in about 3 minutes. My daughter is six and still not a completely stable on a bicycle, but the street to the beach had few cars so were were able to get out and bicycle daily- which she says was her Favorite part of the vacation...along with walking the dog. I was able to cook a nice Holiday turkey in the ample, new kitchen, do laundry with the large washer and dryer, cook out on the grill, shop or dine easily with the close proximity of stores and restaurants. I have to say that for my hard earned money, this was one of the nicest week-long breaks from life we have ever taken. PS- The Mermaid Cottage staff are always only a phone call away: they clearly care about each and every Mermaid visitor. THANK YOU FOR A FABULOUS, PEACEFUL ESCAPE FROM LIFE. We look forward to coming back as soon as possible.